The amplitude of a lightly damped oscillator decreases by 3.0% during each cycle. What percentage of the mechanical energy of the oscillator is lost in each cycle? 5.91% of the mechanical energy is lost after each oscillation. This is College Physics Answers with Shaun Dychko. The maximum potential energy of a simple harmonic oscillator is one half times the spring constant, times the amplitude squared. So in the first case we have one half k times A one squared. In the second case after there is some dampening after one oscillation, it'll be one half times k times the new amplitude A two squared. We're told that A two is going to be three percent less than A one. So amplitude two is A one minus 0.03 times A one which is 0.97 A one. We can substitute 0.97 A one, so amplitude two is going to be 97 percent of what amplitude one was. We'll substitute that in for A two here. This works out to 0.9409 which is what 0.97 squared is, multiplied by one half k A one. One half k A one squared is potential energy one. So I substitute that here. Potential energy two is 0.9409 times potential energy one. 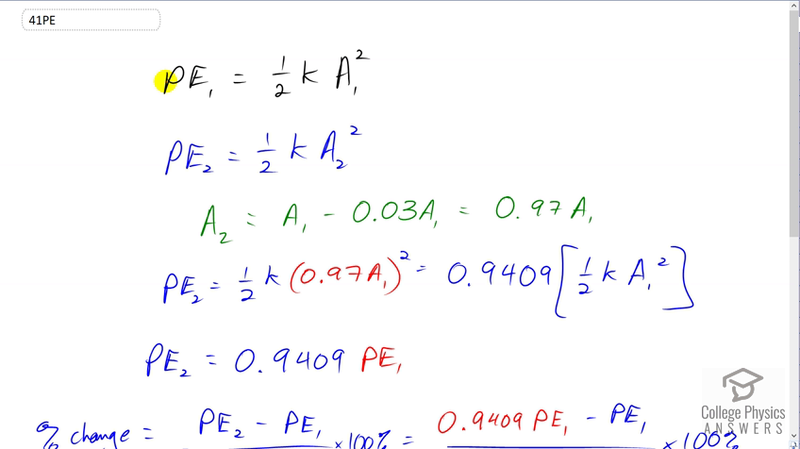 The percent change is going to be potential energy two minus potential energy one, divided by P E one times 100 percent. That's 0.9409 P E one that we figured out just now for P E two, minus P E one over P E one. The P E one's cancel and this turns into a number one and so 0.9409 minus one times 100 percent is negative 5.91 percent. So 5.91 percent of potential energy is lost during each oscillation.